There were very few models that survived the 1970 transition from US-production to Swiss-production. One of them was the 1968 Thinline 5003. It continued to be produced through 1971... probably because it could use a Hamilton 639 movement - which is a Buren movement that was made in Hamilton's factory in Switzerland. As a 5000 series model, you can safely assume it comes in a stainless steel case. It was offered for sale on either a strap or a matching stainless bracelet. Tucked inside the case you will likely find either a 17 jewel Hamilton 639 movement or a Hamilton 686 movement. I believe both were used, depending upon the year. Although the catalog shows a simple cross-hair pattern for the seconds register, I have seen Thinline 5003's with a recessed circle and cross hairs at the sub second position. So I think there are couple of dial patterns out there, depending on if it has a 686 movement or a 639 movement, the latter probably getting the dial with sunken circular sub-second area. Although some collectors turn up there noses a little at the Hamilton models with Swiss movements, I think the grades are actually very nicely designed. 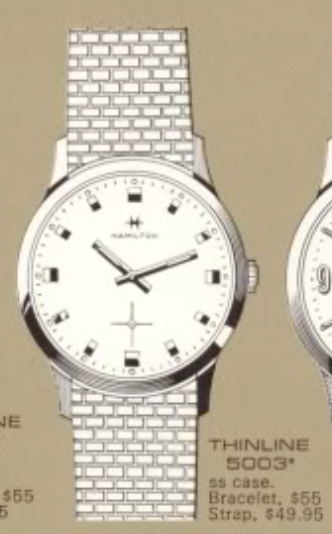 Hamilton used movements from a bunch of different Swiss ébauche makers over the 1950's and '60's. An ébauche is a partially assembled movement... may 95% complete and they were sold to other companies who finished the last 5% to meet their needs. So you'll see ébauche movements in watch brands like Hamilton, Bulova, Elgin, and even high end watches like Breitling. I recently received a Thinline 5003 in need of some TLC. It arrived in the typical beat up fashion with a slight tinge of green on the right side of the dial - a sure sign that some moisture had gotten past the crown and inside the case. The stainless steel back is a bit scratched up and still has some residue from what might have been an original price label sticker. The watch opens through the crystal so the movement uses two-piece stem with the female portion in the movement as shown below. While all the parts are in the ultrasonic cleaner, I will get out my lume kit to redo the lumen on the hands. The parts are now cleaned and dried so it's time for reassembly. The movement is now back to running condition and purring away. Now it's off to the timer to see how it's performing. Running just a smidgen slow - a slight adjustment of the regulator will speed it up a little. The movement and dial goes back into the case so I can reinstall the hands. The crystal is yellowed and scratched up so a replacement is an easy way to make a dramatic improvement. A 29.5mm low dome crystal will be perfect for this low profile watch. I was able to clean up the dial a bit however it's still not perfect. Sometimes moisture can take a heavy toll on a dial. Anytime you get water inside a vintage watch you should open it up and dry it out... or get it a a jeweler or watchmaker if needed. I don't think the dial looks bad enough to warrant getting refinished though. In fact, I think the watch turned out really well.